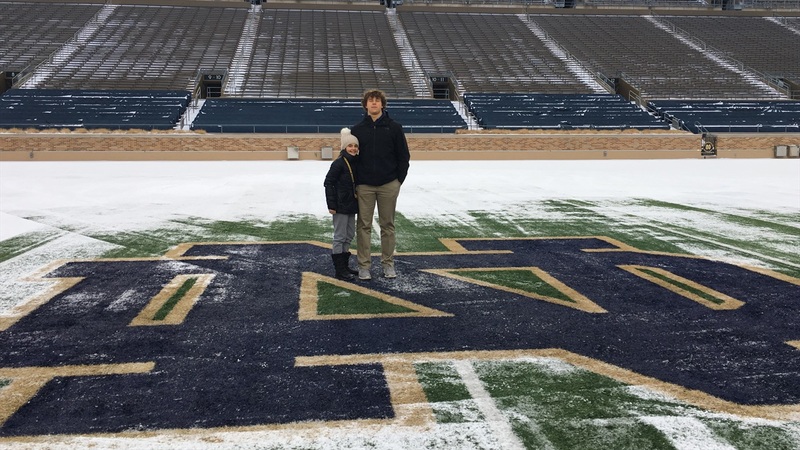 2021 New Trier (Ill.) offensive lineman David Davidkov‍ made his first trip to Notre Dame on Saturday and it blew him away. It was a busy day, but Davidkov was able to experience many things in South Bend on Saturday, including seeing the team go through a training session with Director of Football Performance Matt Balis. After some food, the recruits headed across The Gug to take in a presentation by recruiting coordinator Brian Polian. “He explained how good of an academic and football school Notre Dame is,” said Davidkov. “He told us about how many people went to the NFL and how they are continuing to break records in college football. Davidkov and the other recruits then went over to Purcell Pavilion with Notre Dame’s early enrollees to watch the Irish on the hardwood. The New Trier standout then got some time with offensive line coach Jeff Quinn. “I had a meeting with Coach Quinn and my family,” stated Davidkov. “He talked about what he looks for and talked us through Notre Dame’s offensive line history. The day ended with a photo shoot and a tour of Notre Dame Stadium, which was one of the highlights for Davidkov. “We had photos, so I got to try on the uniform, helmet and cleats,” Davidkov said. “I got to take some photos with my family while I was geared up and that was cool. Davidkov’s recruitment is just starting up, so experiencing Notre Dame was a significant step in being able to formulate what he is looking for in a future program.